MKT-077 is an inhibitor of mitochondrial hsp70 family member mortalin (mot-2), causing the selective death of cancer cells. KNK437 is a HSP inhibitor, and inhibits the induction of HSP105, HSP70, and HSP40. 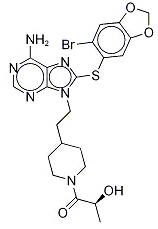 PU-WS13 is a selective Grp94 inhibitor, with an EC50 of 0.22 μM. NMS-E973 is a novel, selective and potent inhibitor of heat shock protein 90 (Hsp90). G-TPP is a mitochondria-targeted Hsp90 inhibitor that increases cell death in HeLa and MCF7 cells, consistently inhibits cell death induced by oxidative stress and mitochondrial dysfunction induced by PINK1 mutation in mouse embryonic fibroblast cells and DA cell models such as SH-SY5Y and SN4741 cells. MPC-3100 is a n orally bioavailable, synthetic, second-generation small-molecule inhibitor of heat shock protein 90 (Hsp90) with potential antineoplastic activity. KRIBB11 is an inhibitor of Heat shock factor 1 (HSF1), with IC50 of 1.2 μM. Retaspimycin hydrochloride is the hydrochloride salt of a small-molecule inhibitor of heat shock protein 90 (HSP90) with antiproliferative and antineoplastic activities. AEG 3482 is a cell-permeable imidazothiadiazole compound that activates cellular transcription factor HSF1 by binding to HSP90 and disrupting its association with HSF1.